The cricket is one of the most annoying insects that I have ever encountered. Why must it constantly let the world know of its existence. We know that you are there cricket, we get it, you are horny and looking for other female crickets to mate with. My question is why must you be so loud and keep us up at night while on your search for love? In fact now that I put a little more thought into it, the cricket is actually like a douche from New Jersey. Let me explain…at night the cricket is on a constant quest to mate. 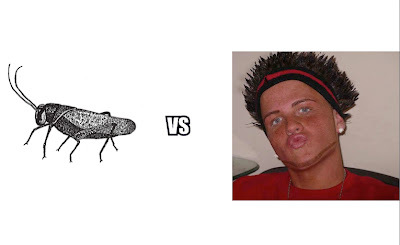 The cricket is both loud, obnoxious , and annoying, not unlike the “New Jersey Douche.” “The New Jersey Douche” comes out at night, usually in packs, like the cricket, and is habitually loud, obnoxious , annoying and constantly on a quest to mate. The only difference that I can see between the cricket and the “New Jersey Douche” is that one lives outside while the other lives in his mothers basement, in Newark.